There's no place like home for the holidays, but sometimes that means mi casa es su casa to our friends and families. Making sure our guests feel welcome and taken care of is just as important as giving them a comfortable space to retreat to when they tire of countless heated games of Yahtzee. A good guest room is a mix of necessities and unexpected charm, from decorations to practical additions. Below, you'll find some of our essentials and favorites. Keep them cozy. Maybe your guests keep their homes a balmy 77 degrees at home and aren't used to the arctic conditions of yours. A pair or two of slippers and plenty of throw blankets will keep everyone toasty and smiling. 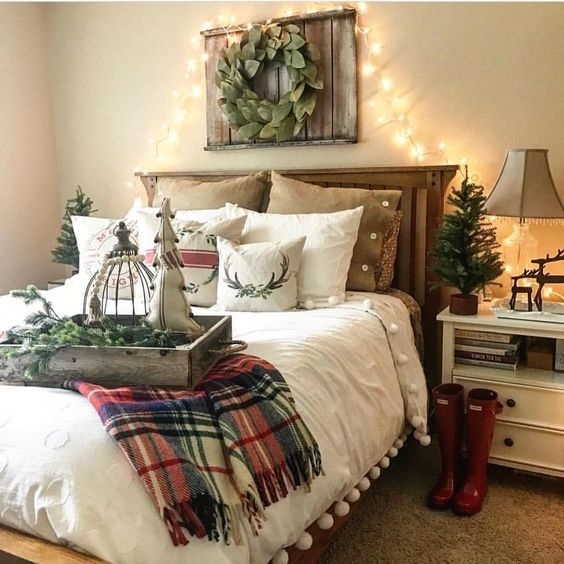 Toss some soft flannel sheets in a festive print or plaid on the bed, too. Stock the bathroom with necessities—and some goodies. Even the most organized traveler will forget toothpaste or conditioner every once in a while. Keep essentials like shampoo, floss, and even a hair dryer handy. It never hurts to throw in some treats, whether it be a beard balm or a bath bomb. Give them the unexpected. A bluetooth speaker for when your guests are enjoying some alone time and a mini coffee maker for lazy mornings make for a perfect home away from home. A fresh stack of towels and a full length mirror make getting ready for a holiday outing a snap. Dress up a nightstand. Give your guests a place to drop their jewelry before drifting off to sleep, and make sure a yummy hand cream (this one is allspice and frankincense) is nearby. Stock a festive candy dish with gumdrops or peanut M&Ms for a midnight snack and keep a decanter full of water (or something a little stronger) in a chic tray. Holiday it. Trim a mini tree for a sweet nightlight, hang some cozy artwork, add sprigs of greenery or winter berries to a vase/smartphone charger, and make sure guests don't forget to jot down their favorite holiday happenings in an animal skin stamped-covered guestbook.